This morning we feasted on a real liturgical treat. Our host Fr. Matthew celebrated a morning Qurbana (the Syro-Malankara rite equivalent of the Roman-rite Mass). He and the server chanted the entire liturgy in the S. Indian vernacular language of Malayalam, while Fr. Matthew interspersed commentary in English to educate us on what was going on. Arranging this liturgy was a generous gift on his part, as it really helped achieve one of the trip’s goals: to introduce participants to the diversity of liturgical forms and traditions within the Catholic Church. Contrary to common opinion which is largely due to ignorance of the existence of non-Roman Catholics, the Catholic Church is not equivalent to the Roman Catholic Church; rather, there are some 22 rites or different ways of being Catholic which are in communion with one another and with the teachings and governance of the bishop of Rome, the pope. After the liturgy, Fr. Matthew brought us to the residence of the Syro-Malankara cardinal-bishop for breakfast. The cardinal was unable to join us, but a few high-ranking priests prepared and joined us for a splendid breakfast in which we were able to try local dishes and partake of fresh fruits grown right there on the diocesan property. After saying good-bye to our faithful friend Fr. Matthew, we hopped in our private van and headed north through Kerala’s beautiful backwater roads and communities towards Cochi. Along the way we made stops at a couple important churches, one recently renovating but dating back to about 1000 AD, and the other one of the seven churches founded by St. Thomas the Apostle. While the church building itself is modern, it stands on the site of one of the first Christian communities in India, whose foundation tradition ascribes to the year 52 A.D. Here we were met by the parish priest who gave us a brief tour and led us in prayer before a relic of St. Thomas housed near the altar. The grounds around the shrine are gorgeous, lined with Gospel scenes, local flowers, and a view of the bay where Thomas likely landed his ship. This evening we arrived in Cochi and were met by our second priest-guide, Fr. Peter of the Syro-Malabar Catholic Church (a different rite from the Syro-Malakara to which Fr. Matthew belongs). All we did tonight was to catch a glimpse of the beach, check into our bed and breakfast, and feast on local seafood in a nearby restaurant owned by Catholic friends of Fr. Peter. The restaurant reminded me of some Mexican restaurants in the U.S., except being more intensely and openly Catholic. There was a little grotto and statue of Our Lady in the restaurant itself as well as certain ‘Catholic’ items on the menu. I didn’t quite pay attention to what these were as I was focused on choosing the right fish to order. I settled on the catch of the day, a Mahi steak simmered in local spices and served on a banana leaf. It was one of the very best pieces of fish I ever ate. It was only about 3-4 ounces of size, but it cost only 180 rupees (about 3 dollars). If you could even get a fresh fish like this in the Midwest–which you practically can’t–you would be paying about 5 times as much for it. This was one small but notable perk of being in India! In the morning we had a nice breakfast at our B&B and then headed down the street for a morning dip in the ocean. The local Indian boys showered our ladies with gifts of seashells, and as ever they all wanted to take pictures and have conversation with us. After the beach, we got cleaned up and Fr. Peter brought us down to the fishing docks to check out the local shopping scene and the catches of the day. This was a cool stroll where we also were able to pass along the fortified walls built by the Portuguese navy who had control of the land in the early 1500s. We stopped by a church built under the leadership of Vasco de Gama. In 1498, he was the first European to arrive in India by sea–achieving what Columbus had set out to do six years earlier. Of course, de Gama did so by sailing south and east while Columbus had tried sailing west and ran into that sizeable roadblock which we now know as America. You can still see de Gama’s tomb in the church, even though his remains were later translated to Portugal. The Church is now Protestant, owning to the fact that the Dutch later gained control of the land after the Reformation period. In the morning we walked through some ancient Cochin neighborhoods and did some shopping on Jew Street, at the end of which stands India’s oldest synagogue, a reminder of the historical fact that the Jews were in Kerala before the time of Christ, thus making even more plausible the claim that St. Thomas had a base from which he could endeavor to found churches there. The afternoon turned out to be one of the highlights of our trip as we had the privilege to meet with two bishops, one a cardinal who had been in Rome to elect Pope Francis only a couple months ago. First Fr. Peter brought us to have snacks and about a half-hour audience with an auxiliary bishop; then we drove to the cardinal’s residence and had a chat with him for about 15 minutes. The poor man had just returned from the U.S. that morning and must have had incredible jetlag, but he graciously met with us anyway. Then we were brought into the refectory to have even more snacks (we had skipped lunch, which made this an even more a delightful treat). Finally, Fr. Peter gave us a nice tour of the St. Thomas museum set up on site. It began with a helpful presentation about the history of the Church in India, and throughout the museum we saw items ranging from local artifacts from daily life in S. India to important documents such as the original version of the first Indian travelogue. This manuscript dates back to the 1700s and gives us important information about the rich, convoluted, and at times tragic history of the Church in India. In the late afternoon we were greeted by a pre-monsoon storm, so our final stop was an indoor shopping mall. It was not just any mall but a hyper mall, the largest mall in Asia, in fact. After dinner in the mall, we made our way to the train station for a 13-hr overnight ride to Nagapatnam where the next day we would be visiting the massive pilgrimage shrine to Our Lady of Velankanni. We arrived at the shrine around lunch time. The place was packed with people and in this respect reminded me more of our experience in N. India the previous week. We checked into a couple dumpy hotel rooms just to store our bags for the day and to have a place to shower before catching our next and last overnight train in the evening. Today at lunch we found on the menu Chicken 65, one of my favorite dishes in Indian restaurants in the U.S. This was a hit, and it became the comfort food for several of us over the next few days as we were fighting off the stomach bug and trying to prepare our bodies for the long haul back to America. We could have had rabbit for lunch, but I am glad we did not; for on our way out of the restaurant we spotted some gerbils in a cage out front. You might think that this is a coincidence, or that perhaps the owners just like to keep their rodent friends around to entertain passers-by. However, given the fact that food in India is usually very fresh (meaning delivered live, killed, and cooked that day), many of us started to question precisely what that ‘rabbit’ on the menu really was! Mass at the shrine was slated for 6 P.M., so in the afternoon we took a stroll along the beach and had a relaxing swim in the warm water. This was enjoyable, but I must say that the beach scene here on the East coast does not match that of Kerala on West or what we expect in American beaches. The beach was incredibly trashy, and there were people and boats all about. There were basically no trash bins, so when people finish their stuff, they just throw it on the sand. Nevertheless, you also find some unique things on a beach like this that you never find in America. One of my favorites was to walk by the random old ladies sitting under umbrellas on the sand selling fresh nuts and other local goodies. The evening shrine experience was fascinating. There are many buildings and features of this shrine complex. For instance, we took some time for prayer in a chapel commemorating the spot where Our Lady twice appeared to children in the 1500s (interestingly, this was going on around the same time as Our Lady appeared to Juan Diego in Mexico on the other side of the world). There were mass and confessions going on throughout the day, as well as 24/7 Eucharistic adoration which we stopped by for about a half-hour. Also interesting was the little museum which had told the history of the place and showcased countless pictures, letters, and gifts sent into the shrine by faithful who had received graces or miracles during their previous visits. Probably the most interesting part about this experience, however, was to see the many kinds of people who came to pray and what they did as a sign of their devotion. You see lots of people walking around with yellow stuff on their heads and no hair because they have shaved their hair as an offering to Mary on behalf of their intercessory request. I asked many people, and I couldn’t get a good answer as to why hair was the offering of choice, but the fact remains that this is what they were doing and that those who were doing it were not just Catholics but Indians of all religious backgrounds. One of the things it made me think–and which I asked my students to reflect upon–was how weird Catholics are! In other words, when we Western Christians walk into Hindu temples and see the faithful performing their rites, we think, “Wow, you are strange; you are backwards; you are not in the truth.” But when we see Christians doing similar things in the context of a different culture and it strikes us as weird, this should tell us just how much of our perception of others’ weirdness is really a cultural bias rather than an indication that those other than us are in the wrong. For me the most trivial but concrete illustration of this involves the practice of taking off shoes to enter places of worship. Whether it was entering the Buddhist center in Kansas City or a mosque in Istanbul, I have never liked taking off my shoes to enter these places, and much less have I enjoyed the smell that results when others who are less clean enter the building with their shoes off. 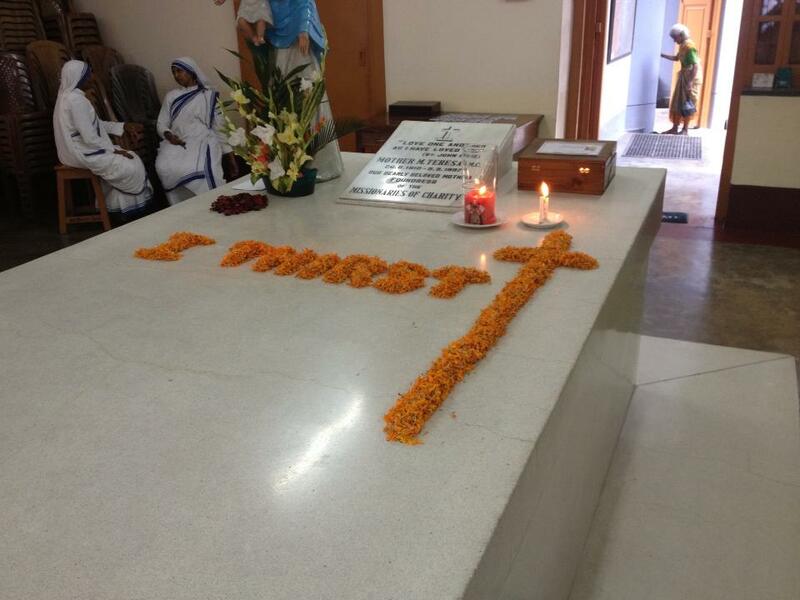 In India, however, Catholics also do this–even in the mother house of the Missionaries of Charity. Again, it’s perhaps the most trivial illustration I could give, but to me it speaks volumes about the need to distinguish what in our worship is essential from what is cultural or changeable. Note: this does not mean that all cultures are equivalent or all forms of worship equivalent. Much less does it imply that all religions are equal. But when you experience the multiplicity of forms within Indian religious practice–and even within the Catholic Church–you come to see that God really is at work in the people and religions of the entire world. When you witness firsthand some of the deficiencies in these religious expressions, you also come to realize in a new way the need to proclaim the good news of Christ to our brother man. After one last overnight train ride, at 5 A.M. we caught a taxi which took us to the ancient Hindu temples at Mahabalipuram, situated just an hour or two away from our final destination of Chennai. Even though India’s cultural is thousands upon thousands of years old, due to the tides of history it is difficult to find many extant testimonies to India’s ancient grandeur. Here, however, we were treated to a temple complex dating to the 5th/6th centuries A.D. Particularly striking is the Shiva temple along the shore overlooking the ocean and the various carvings on temple walls depicting scenes from the Mahabharata, India’s greatest national epic and a most significant source for knowledge of ancient Hindu beliefs. From Mahabalipuram our taxi took us through the busy streets of Chennai (the new name for the port city of Madras) to the shrine of St. Thomas and Noon mass in English at his tomb. The Mass, while celebrated in the Roman rite and in English, itself exemplified the mix of cultures that is India and in particular Indian Catholicism. The Sanctus sounded more like a song sung at clubs with its fast beat and synthesizer in the background; the communion hymn was One Bread, One Body, an American hymn, and the recessional was Lord I Lift Your Name on High, a contemporary praise and worship song within origins in non-Catholic worship. The homily, preached by a young deacon, was quite excellent and recounted the history of Corpus Christi through the theology of St. Thomas Aquinas and the miracle at Bolsena, Italy in the 13th century. It was incredibly fascinating to hear a south Indian preaching about this miracle and this theology, because it reminded me that Western Catholic theology does not just belong to the West but to the whole Church. In other words, the theology of Thomas Aquinas, an Italian, is just as applicable to Indians as it is to Americans. After all, geographically speaking at least, we are just as removed from Italy as the Indians are. When I heard this homily along with the line “we, though many, throughout the earth, we are one body” from the communion song, I was reminded in a way I have never experienced before that the Catholic Church truly is universal. After a nice lunch with another round of Chicken 65, our taxi took us out to Mount St. Thomas where the apostle was martyred. On our ride up the mountain it started pouring, and pouring, and pouring–the third day in a row of rains which made it clear that monsoon season was arriving as scheduled in the Indian subcontinent. Even though the rain was relentless, a few of us ran out to the lookout over the city where Thomas would have had his last view of earth on this side of the grave. At the site there is a poignant memorial which consists in a Calvary scene and a big Cross which a little Cross underneath it. This makes the theological point that Thomas’ martyrdom was, like all martyrdoms, a participation in Christ’s Passion and a reliving of it in each age. This was the last scheduled site visit of our trip, and it was a great way to conclude. We had begun in the north with 117-degree heat, and we now concluded in the south with cooler weather and monsoon rains. The weather from beginning to end had reflected the diversity of people, culture, and religion that we experienced along the way. This afternoon we had one last wild rickshaw ride, did a little shopping, and laid back at the hotel waiting to leave for the airport. Since it was our last day in India and we knew we would have to deal with stomach problems for only a short while longer, we all went nuts at lunch and ate whatever we wanted. I ordered a spicy Szechuan dish for lunch. The waiter asked me, “Are you sure?” When even the Indian waiter asks you this, you know you’re in for a wild ride. It was great, though my stomach disagreed somewhat, but all was well as we finished our meal with butterscotch ice cream, another treat we had previously refrained from eating due to fear of infection from the milk. In the evening most of us had another round of Chicken 65 and headed for the airport. At 1:45 A.M. we said goodbye to Indian and took off from Chennai for 19 hours of flight divided about evenly between the first leg of Chennai to Frankfurt and the second of Frankfurt to Chicago. When we finally got to Chicago, my bag had been lost–just as it had at beginning of the trip on upon arrival in India. In both cases I got the bag back, and in both cases everything ended up being quite fine. It’s just funny because it presents a perfect microcosm of the Indian experience and of India’s cyclical view of time. This trip was many things. It was a cultural enrichment like no other, a wake-up call to the destitution of India’s many poor and abandoned, a quest for the truth and for experience of the world’s many religions, and a pilgrimage of Christian faith where we were tested, refined, and ultimately emerged more or less intact! The Indians advertise their country as “Incredible India.” It is certainly cliche, but nevertheless accurate. I have traveled quite a bit in the world, but what we experienced in India in many ways simply defies description. It is incredible. You just have to see it to believe it. Well, I will be posting some pictures which can help tell the story at least a little bit. I look forward to sharing all the knowledge and experiences I gained with my friends, family, and students. I teach World Religions and one of my goals of this trip was to be better able to do precisely this. I am certain that my students this summer will be bombarded by my India stories. I am also certain that, however well I may teach or convey what I’ve experienced, the real India is something one simply has to see to believe. This entry was posted in Uncategorized and tagged India, Liturgy, Pilgrimage, World Religions by admin. Bookmark the permalink.